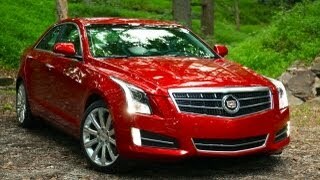 The upcoming Cadillac ATS 2013, an all-new compacy luxury sports sedan, was introduced at the Detroit Auto Show by Cadillac. The ATS 2013 will feature an all-new lightweight, rear-wheel-drive architecture with one of the lowest curb weights in the segment - less than 3,400 pounds (1,542 kg). This lightweight structure will help the ATS deliver more fuel efficiency and improved performance specs. 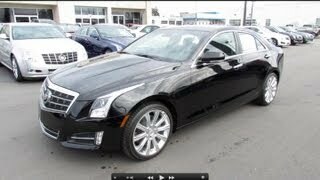 Oshawa, Ontario (January 10, 2012) – Cadillac today introduced the 2013 ATS, an all-new compact luxury sports sedan intended to challenge the world’s best premium cars. Developed on an all-new, lightweight vehicle architecture, Cadillac’s entry into the world’s most significant luxury car segment goes on sale this summer in North America. A broad lineup of engines – including two four-cylinders (built in Tonawanda, N.Y.) and a V-6 for North America – delivers strong power to the ATS and capitalizes on the car’s lightweight structure to complement its performance with efficiency. The optional engines include an all-new 2.0L turbocharged four-cylinder rated at 270 horsepower (201 kW) and Cadillac’s award-winning 3.6L V-6, estimated at 320 horsepower (238 kW). The ATS is expected to deliver 6.5L/100km on the highway. Making the ATS one of the segment’s lightest cars was a fundamental criterion for and the guiding principle during its development, but it was done in a nuanced manner that ensures a refined driving experience. Optimizing the ATS’s mass was the result of a four-pronged philosophy that included strict adherence to original architectural goals, measured load management throughout the vehicle, benchmarking components to see if lighter solutions were available and an overall culture that “weighed” the mass of every component in the car against all aspects of its development. An aluminum hood, magnesium engine mount brackets and even lightweight, natural-fiber door trim panels contribute to the ATS’s low overall mass – and reflect the systematic approach of evaluating every gram that went into the car. But some weight was deemed not only beneficial, but essential to the ATS’s driving experience. An example is the cast iron differential: Engineers found they could improve fuel economy with a cast iron differential rather than a lighter aluminum version. And while the rear suspension is mostly steel, the focus on load management and straight links enabled significant weight savings without using alternate materials. This helps offset the weight of the engine and transmission at the front of the vehicle, helping the ATS deliver its 50/50 weight balance, while also contributing to lower noise and vibration. A similar approach was taken on the wheels, where extra structural aluminum was strategically added to further reduce vibration. 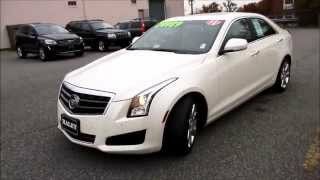 The 2013 Cadillac ATS interprets Cadillac’s Art & Science design language in a new proportion, tailoring the signature styling and refinement cues for the most compact Cadillac while upholding – and advancing – the exemplary attention to detail and technological elements for which the brand is known. A long, 109.3-inch (2,775 mm) wheelbase and wide front/rear tracks are the cornerstones of the ATS’s firmly planted stance, which is enhanced by short overhangs and taut sheet metal that appears to wrap tightly around the tires. Seventeen-inch wheels are standard and 18-inch wheels are available. Real wood, plated metal plating and carbon fiber trim and Cadillac’s cut-and-sew instrument panel, console and doors enhance the emotional connection to the ATS. Choices of many interior color themes, each with unique accent trim material, cover a wide range of flavors – from light, open and warm to black and serious, to bold, technical and sporty. The advanced technology safety features complement the ATS’s roster of other safety features, including eight standard air bags (10 with optional features), safety belt pretensioners and load limiters, StabiliTrak electronic stability control system with traction control and four-wheel disc brakes with four-channel ABS. ATS also features OnStar standard for one year. It can use GPS and cellular phone technology to automatically call for help in the event of a crash. OnStar service also includes myCadillac and OnStar myLink mobile apps, which offer vehicle information, controls and OnStar services via the customer’s iPhone or Android smart phone.